Country Cottage with Fabulous Views. PRIVATE Heated Pool. WIFI. Pets Welcome! Property 1: Country Cottage with Fabulous Views. PRIVATE Heated Pool. WIFI. Pets Welcome! Comfortable house, with use of the swimming pool, in the rolling French countryside. Property 4: Comfortable house, with use of the swimming pool, in the rolling French countryside. A former farm house, spacious and without nextdoor neighbours. Property 7: A former farm house, spacious and without nextdoor neighbours. Cottage overlooking a beautiful park on the edge of a lively village. Property 10: Cottage overlooking a beautiful park on the edge of a lively village. Romantic cottage in historic spot with magnificent view. Property 13: Romantic cottage in historic spot with magnificent view. Property 14: Farm with detached guest house, magnificent views and private pool. Property 22: Spacious house on a hill with views and shared pool. Property 36: Spacious, authentic farmhouse in a hamlet with magnificent view and swimming pool. 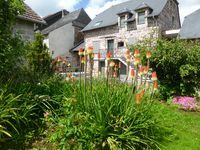 A Charming One Bed Gite Set in the Beautiful Heart of Correze. Property 43: A Charming One Bed Gite Set in the Beautiful Heart of Correze. Property 45: Detached villa with pool, private garden and a beautiful view. This is a barn that has been converted into a house and the conversion is impressive. The result is a comfortable vacation home with plenty of room for large families. It features two living rooms, a large dining room and large well-equipped kitchen. The house is located about 10 minutes from Vigeois and is high on a hill with wonderful views over the surrounding countryside. It is very quiet and restful. One note, a car is absolutely required as there are no services in the immediate area. We highly recommend this house and we will be back.